If you fancy a lifestyle change, or a change from where you live now, whatever your circumstances, you can visit our Castle either as a guest, or as a member of staff, and really enjoy your life. Relax in our Country Park, escape city life and stresses, and embark on a new adventure in the quirky gothic former home of the great Opera Diva, Adelina Patti. Walk in her former pleasure gardens, climb our local mountain, enjoy the meadow walks on our doorstep and our Country Park walks and lakes, our fresh air and beautiful mountain scenery. If you would like a complete change, your very own 'Escape to the Country', then come and work at the magical Craig y Nos Castle. You’ll join our interesting team of individual, friendly and rather different characters in a family business, where all the staff are part of the family (squabbles and all! ), where everyone is expected to muck in, and where you will certainly have a memorable time. But remember, you will not choose Craig y Nos, the Castle's spirits will choose you and if they like you, you'll be drawn to our family, past and present - and you won’t ever want to leave. If it feels right for you, you'll know and the Castle will know. Craig y Nos Castle is a Premier Wedding Venue in South Wales offering exclusive use Weekend Wedding Packages and Weekday Wedding Packages. We are expanding from 88 weddings a year to 120 weddings a year due to more demand following a change in our marketing. The increase in sales put pressure on the existing wedding team which needed to be scaled up. Our 2017 team of 3 Wedding Planners and an Events Manager needed to be doubled to a minimum of 6 wedding planners with one being the overall Wedding Department Manager. A number of new arrivals and departures in 2017/18 took place, but as of Jan 2019 the team seems to have stabilised at 3 Wedding Planners, 1 Wedding Assistant, and one Wedding Manager. We have not yet made a decision to increase to the 6th person but could be about to. If you are interested in this position, it is worth making yourself known to us, in case at the time you enquire, we have a vacancy. The job is high pressure, due to administratively complex and precise demands of Wedding Couples in the planning stage of their wedding. The job is not purely administrative, as you will also be running the actual weddings, including all aspects of waitressing, bar service etc., in order to direct and manage the existing Front of House team in line with the Wedding Couple's Running order of the Day. You will need excellent interpersonal skills, a sunny and friendly disposition, and excellent administrative skills. Good administrative skills are essential when planning a wedding as every promise you make to a Couple needs to be logged and followed through. This means logging everything accurately on our wedding database as it happens, all emails and all telephone conversations. You will also be expected to support the Wedding Sales side. We have 10 to 15 wedding viewings a week, each one requiring professional handling, so you are able to identify the most suitable wedding package for them and you will learn how to close the sale. Closing the sale mainly involves ensuring the venue is looking at its best before each viewing, even if this means you personally laying up the tables in the Wedding Reception room to ready a room for viewings. You also need to be familiar with all our Wedding Package Tariffs so you can instantly identify the right one for the Client. Many visitors to the Castle are walk-in wedding viewings, but they do not announce themselves. So, you will also be expected to work on reception, alongside the wedding reception team, and be alert to the 6 or 7 wedding couples who arrive unannounced for a look around. 1:2 of these will book a wedding if correctly spotted and given a show-around. This means it is your responsibility to ensure the Venue is always looking its best - all rooms need to be clean and tidy and laid up as if for a wedding, so the rooms look as they do on the website, all the time. People do not book weddings if the place is not looking perfect, all the time. Commission is payable on all sales. Booking just 25 weddings in your own name can earn you an extra 2,500 pounds a year. 2 / 3rds of all viewings are by pre-booked appointment generated for you by our wedding website. Prompt acknowledgement of all Wedding Couple appointments and follow through on enquiries is required, as most Couples wish to decide within 7 days of viewing the venue. No-shows will need prompt follow up as well; 1:3 of all those who come to view the castle will book the venue, but they have to come here first! Before applying for this post, please read the planning pages on the Wedding Website - starting here. Also, familiarise yourself with all the pages on the general Wedding Planning pages starting here. If you find this material does not interest you, then this job is not for you. We need people who are passionate about giving excellent service to our Wedding Couples. They are placing their trust in YOU as their wedding planner, to look after the most important day of their lives. This is a job that requires maturity, good person-to-person skills, excellent administrative and database entry skills, personal courage and strength of character in the face of things not going your way, and a determination to see every wedding through to a perfect conclusion. 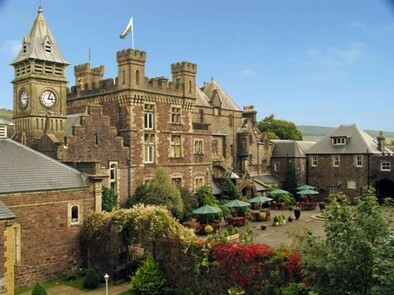 Craig-y-Nos Castle is a Boutique Hotel and popular Wedding Venue located in South Wales between Swansea and Brecon. We require a complete team of Chefs to provide quality set menus (Wedding Breakfasts and Buffets) and to prepare the usual cooked breakfasts, a la carte cuisine, bar meals etc. for hotel and walk in guests. From the applicants received we wish to recruit a Lead Chef who will be consulted on the recruitment of the rest of the kitchen team. In the first instance we require your CV together with a recent photograph and salary expectations. Ideally candidates will wish to live in and there is accommodation available at a reasonable rent. We are looking for professionals who take pride in their cooking and concern themselves about hygiene, cleanliness, food management and cost control. Compliance with Food Hygiene regulations and paperwork is ESSENTIAL. For the right people we are able to offer an attractive working environment with genuine career prospects. In the first instance please contact Ian Bloom on 01639 730725 or e-mail Ian.Bloom@selclene.co.uk. So, if you can cook, we are interested in you! The position is live-in if required, or not, if not required, it would suit a couple or single, you can be either. The role is expandable, depending on ability and qualifications, and additional training is available. If your other half is administratively inclined, we have a part time bookkeeper position also available, and we always need staff to help out around the castle in any number of roles. The more flexible you are, the better. We want 'can do' people who can do the job, and who actually enjoy serving customers good food. The hours can be flexible - as you can choose to work 3 - 4 days a week as below, meaning you would not need to relocate if living some distance away. In winter we operate a 'winter trading' policy, which means you get three to four midweek days off a week. However we do have 110 to 130 weddings a year, some of which are midweek. We have a ground floor garden room / staff flat with kitchen/ lounge / en-suite and bedroom etc available by negotiation if you wish to work a full weekly shift and if you have a partner who can assist in other areas at the castle (see other vacancies on this page). Alternatively, if you do not wish to relocate, or are looking to work a 3-4 day week, we have an opportunity for you to commute in, work a long-weekend shift (Thursday, Friday, Saturday, maybe Sunday morning) with 3 1/2 days off a week Sunday afternoon, Monday, Tuesday and Wednesday, returning for the evening shift Thursday. In this case you would be able to use the Staff Accommodation rooms used by late shift / early shift staff as required. You could conceivably have another job for the other days of the week, remaining in your own home town. Or come to us full time if you prefer. It would be useful if you can also manage staff, pot washers etc efficiently, keep the place clean, and of course maintain all the necessary paper records, correctly. You will need to have the necessary qualifications for chef work. If you can cook, but require further qualifications to work on your own, we can facilitate this for you, with external training. We are in a rural area. Getting to us involves a long journey for a lot of people. Finding local people is difficult for us. We routinely employ people as far away as Bristol, who stay with us a few days of the week, returning home when not working at the Castle. If you are within a half hour's drive of the Castle (Neath/ Swansea area) then you would not need to relocate, but if you are some distance away, you still do not need to fully up-sticks. You can work a 3 - 4 day week, so you would be able to commute from a longer distance, work the weekend shifts, and take half the week off back home. Or you could start off part time, see how you get on, then relocate later if you wanted to make a full-time career with us. All staff on late nights / early starts and longer shifts may use the temporary Staff Accommodation here at no charge, subject to arrangement / bookings. on the links provided above, and satisfy yourself in your own mind that you have the ability to cook these meals. When applying for a job with us, we start with a telephone interview and a check of documentation and references. Once past this stage, our General Manager Ian Bloom will require you to cook some meals to demonstrate your competence. You will probably need to stay here a couple of days, join the existing team, and cook some meals for our own quality checks. You will of course be paid for this. You will need to supply a CV and have the necessary food hygiene documentation, qualifications etc, for our General Manager to check, plus a couple of references that we can phone and check. We have a vacancy for a Front of House of Manager who can manage waitresses and bar staff and cover for anyone who cannot do a task and re-train waitressing and bar staff as necessary. Will also need to manage payroll to control staffinng costs within fixed budgets using a wages rota excel spreadsheet in conjuntion with our bookkeeper. Must be experienced in managing and getting the best out of waitresses and bar staff. Must be a good administrator and able to work with Excel spreadsheets. The castle's events business tends to be weekends Thursday to Sunday, with limited trade Monday to Wednesday. So an intense 4 day week with long hours and then 3 days off Mon to Weds would suit us. If you have good admin skills then budget control work, monitoring spend on suppliers and wages is an aspect you could add in on one of the non-trading days Monday to Wednesday. To see the trading pattern - see our 2018 Events Calendar here. Professional attitude at work is essential, we require maturity and an ability to manage a young teams of staff who need direction and instruction. You may opt to work one long day a week or two shorter days, rather than full time. But if you are qualified and really experienced, we can employ you for more tasks. It would be good if you were qualified with some bookkeeping skills but we have been managing without a bookkeeper for a while, as our Business Manager has been fulfilling this role with existing staff being able to help out with the more routine tasks. However this has taken up other staff's time doing tasks we would prefer to employ a dedicated bookkeeper / assistant to do. (b) for someone able to do the full job spec (see below). We are happy to take someone on who is keen, initially to do the simpler tasks, and then expand into a broader and more qualified role. A bit like an apprenticeship, where you grow into a more advanced and qualified role over time. In this case you would start with simpler admin tasks such as excel spreadsheet data entry, banking, and wages rotas, suppliers budget monitoring, etc all of which tends to be on excel spreadsheets and is easily learnable if you enjoy Excel and have a systematic tidy mind. Then if and when you are able to take on more, you can 'grow into' a wider role, with more authority (as the senior positions are really 'management' level) for which suitable internal and external training can be arranged. "....part time book keeper 16 hours per week to undertake the Bills To Pay, The Suppliers Spreadsheet and any odds and ends, with perhaps a once a month run on the payroll." He has also added: "Sage Payroll or Xero Accounts Package or simillar experience would be be beneficial". But we can get you trained up in these if required. However we are able to consider an expanded role for interested applicants and we are keen on developing anyone who wants to do more than they currently have experience in. What a refreshing change from all those ads that say you must have experience in this that and the other program etc. Really it all comes down to is your own attitude and interest in developing the role with us. Your role can be part time or full time, as it is able to be developed around your own preferences, available time, and according to your ability and skills. If you have an interest in advancing your career with us, we will invest in you. Knowledge of Xero would be rather useful and lead to a more expanded role! Again, we can get you trained in this by our accountants as it is very useful to have this and other program skills. For a full Job Spec if looking for a full-time position, click here. Even if you can only be a part time assistant with knowledge of Excel and a good admin mind, you will also be of help to us.